This scroll bracket is made for signs with a rounded top.The HDU sign is double-faced and sandblasted, with a 3D bas-relief oak tree applique.This handsome upscale street sign and aluminum post has a hanging bracket, ornamental base and finial on top of the post. The green color is used for all components. Our street and traffic signs can be mounted on our round aluminum posts in several ways, as shown here. .This section of Gallery 17 shows custom street name signs and posts. 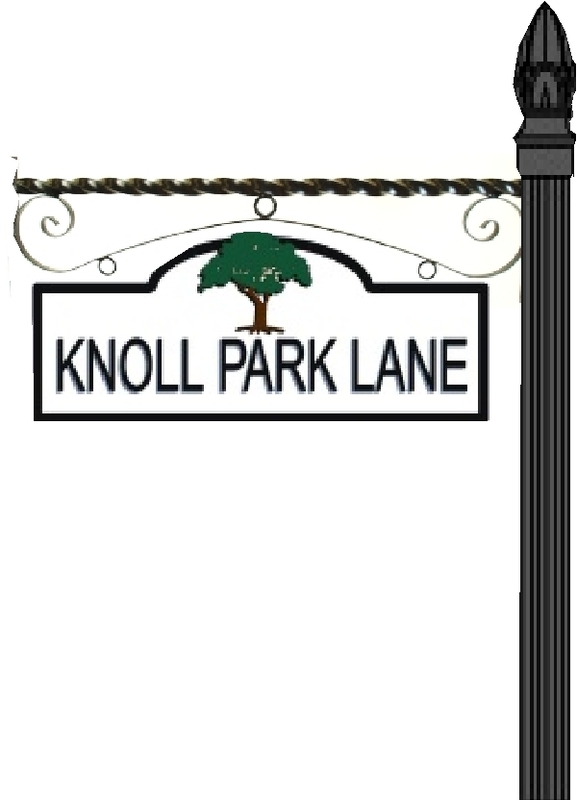 Our street name signs are made of HDPE (high Density Polyethelene, including ColorCore@; High Density Urethane (30 lb/ft3), or wood (typically Redwood). These are all carved, either with raised text and borders or engraved text. Simple art and logos can also be added. We also make custom aluminum street signs, iron sign frames, sign holders, aluminum and iron signposts, bases and finials.